Car giant Ford will offer voluntary retirement and other financial incentives to some 15,000 workers in a bid to cut 1,400 jobs in North America and Asia. 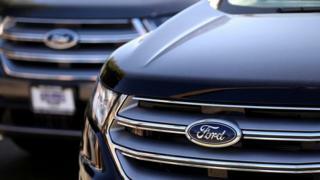 The downsizing comes as the US carmaker faces weak sales and declining profits. While the job losses are lower than early reports had suggested, the plan is part of an "accelerated attack on costs," the firm said. It is not clear how much it will save. Ford chief executive Mark Fields told analysts last month the company would maintain an "intense focus on cost" to prepare the firm "for a downturn scenario." Ford sales that fell 7% in the US and 11% in Europe in April compared to the same month in 2016. The firm has also been hit by costs related to safety recalls. Shares have fallen more than 15% in the last 12 months. Ford said on Wednesday the newest round of cuts are not aimed at hourly or production workers and will not affect Europe or South America. Workers will get more details in June, said spokesman Mike Moran. The company expects the downsizing to be complete by the end of September. Ford employed more than 200,000 people around the world at the end of 2016, including about 101,000 in North America and 23,000 in Asia. Reality Check: Did Donald Trump save a Ford factory? The company, which claims about 7% of the global car market, has added thousands of workers in recent years, responding to strong demand. But more recently it has reversed course. Ford has cut 3,000 jobs in South America since 2013. Last year, it slashed hundreds of jobs in Europe to reduce costs by $200m annually. It also cut about 2,000 roles in Asia, its annual report said. Job cuts, including at Ford, have been political footballs, with US President Donald Trump claiming credit for the firm's cancellation of a plant in Mexico. Word of the downsizing was met with dismay from US Congresswoman Debbie Dingell, whose district includes Ford's Dearborn, Michigan headquarters. In a statement she called the company "the lifeblood of our community". "Every job matters, and we need to ensure we are doing everything we can to ensure a strong manufacturing base and a healthy thriving auto industry," she said.